This was done in collaboration with 600 volunteers from PriceWaterHouse Coopers. They adopted Banda Street and had been involved in different community projects for the past 7 years in aid of the residents who live mainly alone in one-room flats. This must be my Signature Wall there. This image was featured in an article in The Singapore Straits Times on January 1st, 2018 a befitting way to start the new year! 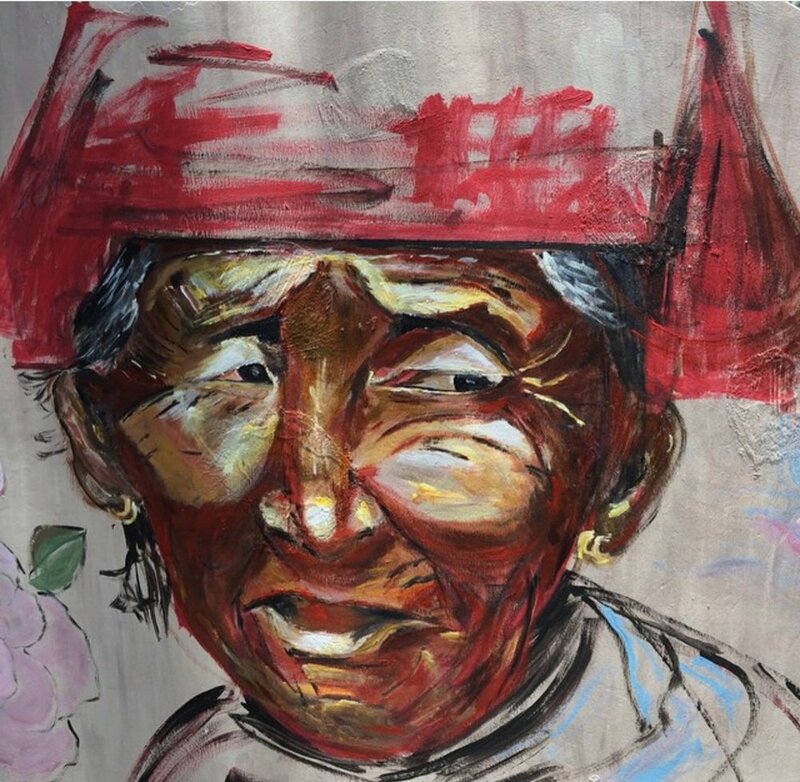 The Samsui woman is a MUST as she lived in the vicinity and other strong women who came from China of whom one of them is still around ad we all call her PoPo (Grandma) whenever we see her. She lives alone and is very independent. I know for a fact that she is in her nineties. If you are lucky, you can see her walking around especially during lunch time. She would talk to anyone who approached her but she would not take photos as it's considered taboo from a superstition of her time. I admire such women as I identify with them for their strength and courage to move on in bad and hard times and facing challenges along the way. What a start to the New Year The ST article appeared on January 01 2018 in their Life page. This is beyond my imagination and I feel very blessed for what's happening in my life and art journey now. At the very start this was how she looked like. The toothless heroine who’s my inspiration and who stands for everything that I want to aspire to be - strong, independent, fearless, and resilient! Slowly taking sharp. Now I had done her face, it’s time to move on to the rest ie. her sisters and the other side of the wall. I wanted to share this cos someone took it for me while I was busy doing the upper section showing the other older sister at work at the window. I had to get used to the crowds that come and go and this place was especially busy during the weekends but I am grateful I was able to take two weekdays off to do this till the end of the project. Photo Courtesy of Shona Trench. It’s Women Power! “Thank you for your visit, sisters”, she said. Next to the Chinese house, here's the grandma and cos it's near to Chinese New Year, memories of my childhood came to mind. As a kid, we wear our new pyjamas the night before and it symbolises new clothes to wear the whole year when we wake up with these new jamies. The man on the right signifies my grandpa and since there are musicians around in this area, that I like my grandpa to play some music while grandma does the work of pasting auspicious messages on our house wall as we looked on. The other children are my cousins who I lived with in. The wall as it is after it’s completed. After the completion of this wall, at the end of the project when Mr Chan Chun Sing graced the occasion that he talked and asked if I would like to do Holland V. This particular wall has a significant meaning in that it was Cheong Wan Seng Lane -FIFTY YEARS AGO. It is a secondary road off Cross Street which is the main road right at where PwC was. 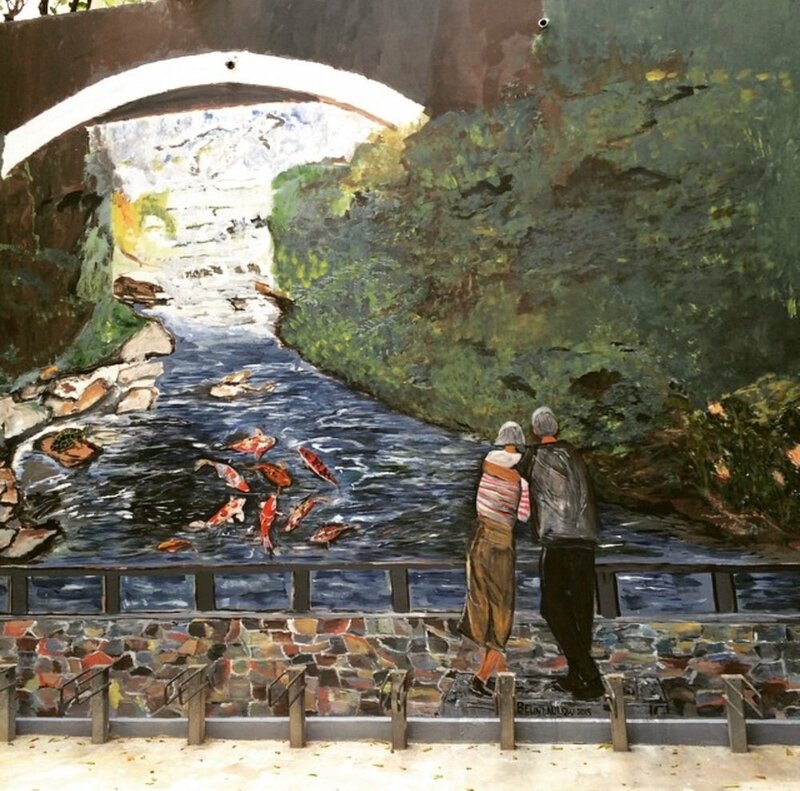 I so happened to see this image and it was like it was meant to be painted on this wall. This is now the lane where we walked diagonal over to the other side towards Republic Plaza (now known as GCH Equities Bldg) to take the EW train. Now the loving couple can be together forever in a heavenly quiet place. Not sure if you can recognise them? Anyways, when I asked a lady while painting them there, she mentioned if you can tell the woman, you will know who the man is so I know they are recognisable. Not showing their faces for obvious reasons. I leave it to you the viewer to decipher who they are. This air well is also where the stair case is where you take to walk over to Kreta Ayer. As it’s the Chinese New Year period, I added 9 koi fishes. Today, there is a notice informing others not to clutter the place as this is where the ‘karang guni’ man (a local name for a collector of unwanted household items) stashed his boxes. The wall at the other side that's toward North Bridge Road. Got to walk across and over to this side that is where the food centre is. 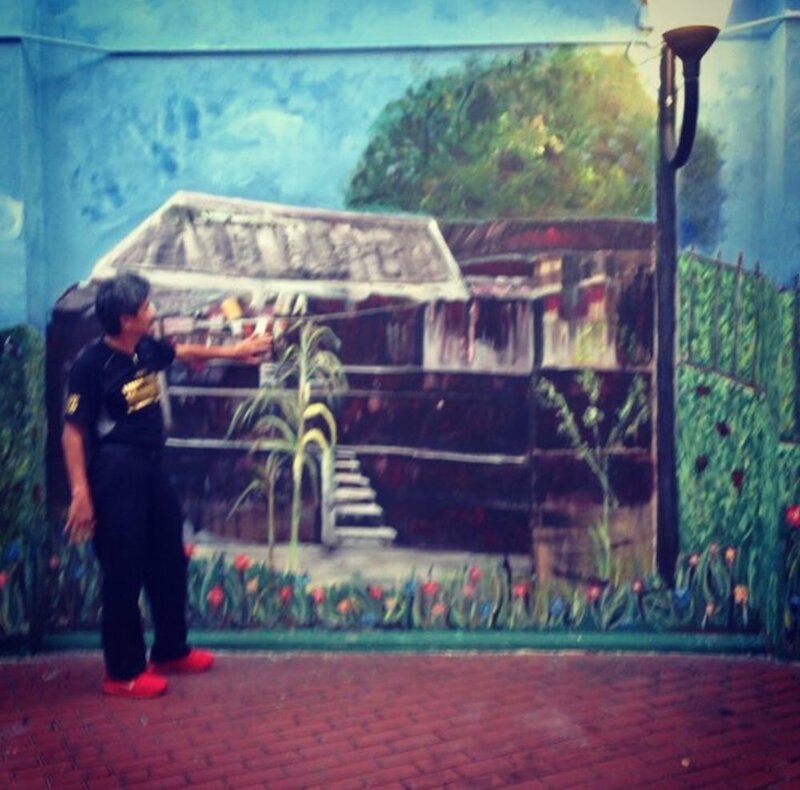 The kampong home of Mr Tan Chuan immortalised on the wall. It was a poignant scene as I saw this. Here Tan Chuan looking at his house where he lived during his childhood. Life was simple then. The picture is not very clear, but there was a boy and an man standing on the front just behind where the sugar cane was. That boy was him and the man his uncle. He was my first supporter where he commissioned me to paint this house for him on canvas when I first started painting in 2013. . He had fond memories of this place with the huge durian tree behind and those days, though they were poor they were happy and free. I caught an elderly woman doing her daily exercise (qi-gong) at the space. It looked like it’s her village and she lives just round the corner or even at the house behind. Come on my dear. We have to catch up with them. Viens mon amour! Nous allons Rattraper les autres. Vous voulez nous rejoindre pour le Tour de Chinatown? The Tour de France right here in Chinatown? Francois and Louis Duffie representing France. My first attempt at the chess players whom I saw a lot of them at the square so decided to add them here. The long wall which was where we started the project at the Kreta Ayer People's Theatre. I decided to add the chess players as this seems to be the favourite past-time for the men here. You can see them every day at the Square. The finished FIRST section at Kreta Ayer. When you walk down the stairs on the right, this area is actually by the side of Keong Saik Road. If you dissect each image, this entire place has 7 walls that make up the entire stretch excluding the stairwells. Just as the men were into chess, these brothers are into cards. After Cezanne's The Card Players. Les joueurs de cartes This is one of my favourite images.. The brothers trying to emulate the poses and do the tai-chi with these men. 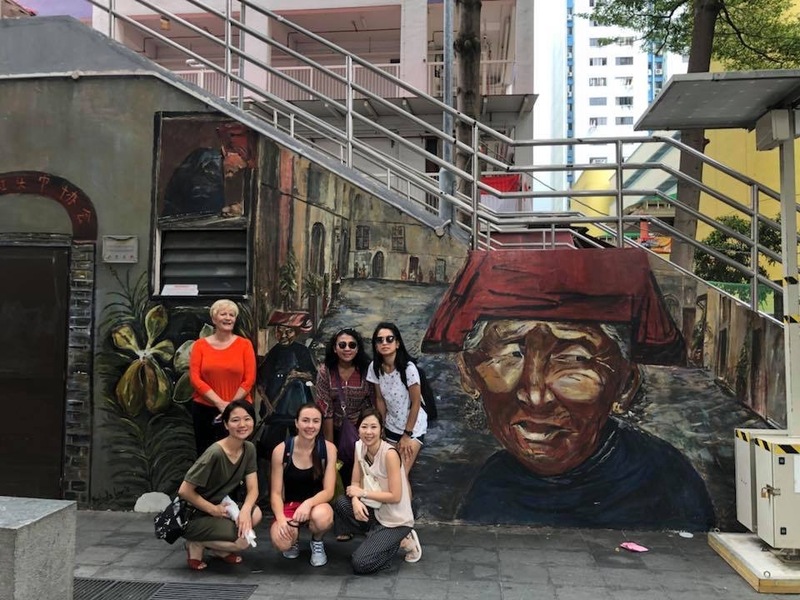 My French professor Pierre Duffie and his brother who was visiting and I must say they did quite well...this wall is directly facing the junction where Keong Saik Road is. This is by the stairs just above where the Samsui is. You can't see this unless you walk up the stairs and it's to your left. There is a map downstairs showing all the walls. They even requested us to paint both sides of the walls at the food center. This is a relatively smaller wall compared to the rest. It wasn't easy to manage and direct the volunteers on what to do except that they could o only help with giving some color to the background. We were in quite a rush to finish as there was a deadline. No time to even touch up! A friend thought I was a drawing a snake. But it’s actually me sketching the entire wall which is a landscape with a waterfall. Me at the wall Oh How I wish I can this everyday! You can see the happiness here…It’s sheer bliss!